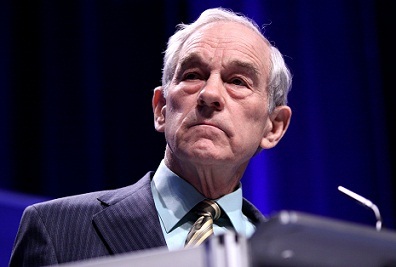 By far the oldest candidate in the race at 75, Ron Paul is suddenly a top contender. He has a lot of younger supporters, mostly because he favors legalizing pot, and adopts the sort of extreme intellectual positions that have also drawn college age kids to "pure" philosophies like Communism and Ayn Rand's Positivism for generations. You know, "clean" uncompromising positions that get rid of all those messy human feelings and complexities. Ron Paul loves to brag about being a straight-talker who doesn't change his positions. He says he would have voted against the 1964 Civil Rights Act (on property rights grounds, not to defend racism natch.) He wants to legalize all drugs, including heroin, withdraw all US troops from other countries immediately, end government flood control efforts and return to the gold standard. Ever since he began running for Congress again in 1996, Ron Paul has tried to downplay or deny responsibility for some incredibly racist newsletters he sold to that conspiracy crowd. But it's hard for him to deny responsibility for a publication called "The Ron Paul Survival Report", edited by Ron Paul, when it says stuff like "When I was in Congress....." He had no problem cashing the checks certainly. And if it wasn't paranoid militia conspiracy, why was it called the Survival Report? The sad truth is that Ron Paul is a consummate politician. He's just better at tailoring his message to his different audiences than, say, Mitt Romney, whose adjustments are painfully obvious. Ron Paul is the cool grandpa pothead to college kids, the prophet of racial fear to neo-Nazis, an opponent of public schools to Christian home-schoolers, and a crusader against the coming One World Government to the anti-flouride conspiracy crowd. And each group thinks he's their own, special warrior. Over nearly 20 years, the newsletters published a bunch of hateful and inflammatory racist, anti-gay and conspiratorial columns. You can read 50 of the originals on this website. Warning -- it's pretty raw stuff. In 2001, as Paul moved to the mainstream and rejoined the Republican party, he disavowed these comments and blamed them on an unnamed ghostwriter. He said he didn't know about them until ten years later -- a statement easily proved false -- and that he had lied in 1996 when he didn't say he didn't write them. "Given the inefficiencies of what DC laughingly calls the criminal justice system, I think we can safely assume that 95 percent of the black males in that city are semi-criminal or entirely criminal." When the Dallas reporter asked Ron Paul about that quote, he said "These aren't my figures. That is the assumption you can gather from" the report. Paul and his supporters claim that he moved to Texas, the newsletters stayed in Washington, and he was too busy to even look at the 8 page newsletter that earned him a million dollars a years. (So much for Texas straight talk.) We have direct evidence that he's lying. Renae Hathaway, Paul's former secretary who still supports him, says that Paul was a very hands-on owner of the newsletters: "He always got to see the final product. He would proof it." (Another longtimeemployee, Eric Rittberg, confirms that he saw Ron Paul proofing, editing and signing off on the newsletters.) Hathaway said the newsletter company had an office in Houston and another one in Clute, very near Paul's house, and that he came to Houston -- 50 miles from his home -- at least weekly. Ed Crane, the longtime head of the Cato Institute, recalls meeting Paul in the 1980s and discussing mail solicitation lists for the newsletters. Paul agreed that “people who have extreme views” responded best, and said he got his best response from the mailing list for the conspiratorial, anti-Semitic newspaper "The Spotlight." Rittberg says that Paul put the racist material in the newsletters simply to make money -- "the real big money came from some of that racially tinged stuff -- and it seems to have worked very well. The President manages millions of people. Even if you take Ron Paul at his word, he couldn't manage a staff of 10 without them suddenly printing extreme racist progaganda FOR TEN YEARS. I just don't believe him, but if you do, he's a piss-poor manager. More likely he happily trafficked in the racist material to make money. And it worked. In 1984, Paul reported dept of up to $765,000; by 1995, most of the debt was gone and his net worth was up to $3.3 million. The question remains, does he believe any of this stuff himself? The thing is, Ron Paul has published a lot of similar (but milder) material since then, and much of it is still on his congressional website, under his name. (Read any of his "Texas Straight Talk" columns from 2005 or 2006, and you'll see what I mean.) He rails against "anchor babies," warns of conspiracies to impose a "North American United Nations," complains about secret cartels of international bankers -- all big parts of the racist right-wing's world-view. (See quotes, above.) So far he hasn't claimed that someone else wrote these "Texas Straight Talk" columns, but I haven't seen any reporters ask him about them, either. He said on MSNBC that the Civil War was not necessary, and gave a rave review to a pro-Confederacy revisionist book called "The Politically Incorrect Guide to American History" by Thomas E. Woods. Ron Paul said Wood's book "heroically rescues real history from the politically correct memory hole.” Woods, who founded the secessionist group "League of the South," and Ron Paul both teach at the Ludwig Van Mises Institute in Alabama, which was founded by Lew Rockwell -- Ron Paul's former chief of staff. In fact, many Paul supporters claim Lew Rockwell wrote the racist newsletter columns under Ron Paul's name, but Rockwell denies that. The fact is, Ron Paul has said a lot of things similar to (but milder than) the shocking newsletter quotes, things he does not dispute. In 2007, Dr. Paul republished his 1987 book "Freedom Under Siege" which has a lot of choice passages, such as calling the AIDS sufferer "a victim of his own lifestyle [who] victimizes innocent citizens by forcing them to pay for his care"; saying sexual harassment victims bear some responsibility because they didn't quit their jobs; and complaining that whites would be called bigots if they formed a white caucus in Congress, but minority caucuses are OK.
Ron Paul is firmly enmeshed in the right-wing, conspiracy subculture. He has appeared on the Alex Jones radio show 40 times over 12 years, and given extensive interviews to the John Birch Society newsletter. So whether or not he wrote any one particularly nasty racist sentence of a given issue, he is behind all of it. He has been living in that world for years, building connections with the people in it, spreading its ideas, and making money off of doing so. It's cowardly of him to deny it all now. Ron Paul's Texas Straight Talk (archive), on his Congressional Web site.